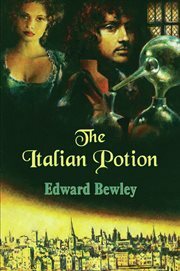 The item The Italian Potion, (ebook) represents a specific, individual, material embodiment of a distinct intellectual or artistic creation found in Charlotte Mecklenburg Library. Alchemists and courtiers seek to confound Francis Wyld as he investigates the death of a Frenchman in London in 1663. Wyld, a gentleman adventurer and sometime philosopher, is asked by close friend Robert Delaney to find a priceless alchemical text which the Frenchman was to deliver to him. The quest leads to Whitehall where it becomes intertwined with the political and religious intrigue within the court of Charles II. Meanwhile, Wyld's own fate is threatened by the attentions of one of the King's mistresses, Lady Castlemaine. Tragedy and treason are destined to follow. Can Wyld bring to justice the fanatical mastermind who threatens the highest officer in the land?